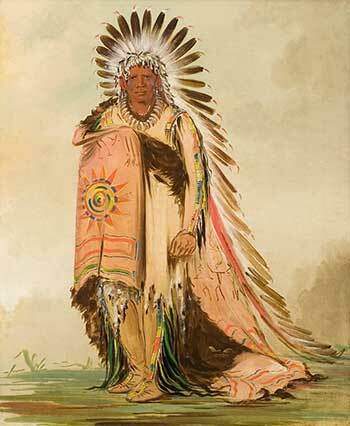 Wá-ee-ton; Chief of the Sus-se-ton band, Upper Missouri; full-length, in a splendid dress; head-dress of war-eagles' quills and ermine, and painted robe. 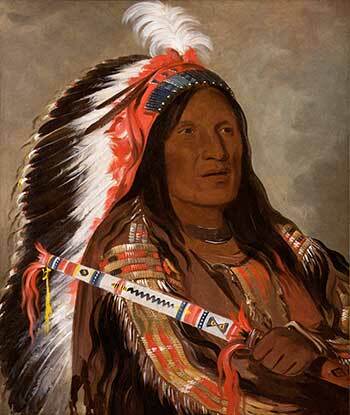 One of the most noted and dignified, as well as graceful chiefs of the Sioux tribe, 1835. Táh-téck-a-da-háir, the Steep Wind; a Brave of the Ca-za-zhee-ta (or Bad Arrow Points) band. Kay-a-gis-gis, a Young Woman; a beautiful young woman pulling her hair out of braid. Ru-ton-ye-wee-ma, the Strutting Pigeon; wife of White Cloud. George Catlin never claimed to be particularly knowledgeable about the origin of the North American Indians, even though his travels and observations made him one of the most familiar experts of the time. Despite his reservations, several of his books contain notes regarding their origin. He was careful to note the common similarities between tribes, particularly in the practices of custom and appearance. Though many similarities did exist among the natives, Catlin was also careful to note differences as well. "Of the general appearance of the North American Indians, much might be yet said that would be new and instructive. In stature...there are some of the tribes that are considerably above the ordinary height of man, and others that are evidently below it; allowing their average to be about equal to that of their fellow-men in the civilized world. In girth they are less, and lighter in their limbs, and almost entirely free from corpulency or useless flesh. Their bones are lighter, their skulls are thinner, and their muscles less hard than those of their civilized neighbors, excepting in the legs and feet, where they are brought into more continual action by their violent exercise on foot and on horseback, which swells the muscles and gives them great strength in those limbs, which is often quite as conspicuous as the extraordinary development of muscles in the shoulders and arms of our laboring men." 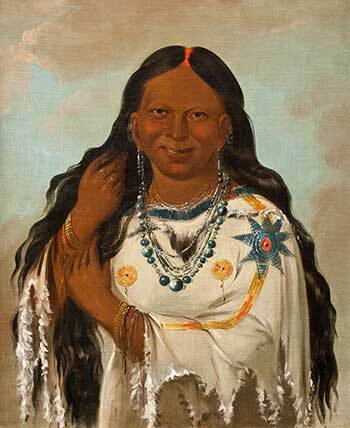 "There is a general and striking character in the facial outline of the North American Indians, which is bold and free, and would seem at once to stamp them as distinct from natives of other parts of the world. Their noses are generally prominent and aquiline – and the whole face, if divested of paint and of copper-color, would seem to approach to the bold and European character. " "Many travelers have thought that their eyes were smaller than those of Europeans; and there is good cause for one to believe so, if he judges from first impressions, without taking pains to inquire into the truth and causes of things. I have been struck, as most travelers no doubt have, with the want of expansion and apparent smallness of the Indians' eyes, which I have found upon examination to be principally the effect of continual exposure to the rays of the sun and the wind, without the shields that are used by the civilized world; and also when in-doors, and free from those causes, subjected generally to one more distressing, and calculated to produce similar results, the smoke that almost continually hangs about their wigwams, which necessarily contracts the lids of the eyes, forbidding that full flame and expansion of the eye, that the cool and clear shades of our civilized domiciles are calculated to promote." "The teeth of the Indians are generally regular and sound, and wonderfully preserved to old age, owing, no doubt, to the fact that they live without the spices of life – without saccharine and without salt, which are equally destructive to teeth, in civilized communities. Their teeth, though sound, are not white, having a yellowish cast; but ... they look white – set as they are in bronze, as any one with a tolerable set of teeth can easily test, by painting his face the color of an Indian, and grinning for a moment in his looking-glass"
4. Their beards – which were commonly plucked out at puberty in a painful extraction process. "Beards they generally have not – esteeming them great vulgarities, and using every possible means to eradicate them whenever they are so unfortunate as to be annoyed with them. Different writers have been very much at variance on this subject ever since the first accounts given of these people; and there seems still an unsatisfied curiosity on the subject, which I would be glad to say that I could put entirely at rest. From the best information that I could obtain amongst forty-eight tribes that I have visited, I feel authorized to say, that, amongst the wild tribes, where they have made no efforts to imitate white men, at least, the proportion of eighteen out of twenty, by nature are entirely without the appearance of a beard." 5. The strong nature of their women and children. "The Indian women who are obliged to lead lives of severe toil and drudgery, become exceedingly healthy and robust, giving easy birth and strong constitutions to their children; which, in a measure, may account for the simplicity and fewness of their diseases, which in infancy and childhood are very seldom known to destroy life." "As to the probable origin of the North American Indians, which is one of the first questions that suggests itself to the enquiring mind, and will be perhaps, the last to be settled; I shall have little to say in this place, for the reason that so abstruse a subject, and one so barren of positive proof, would require in its discussion too much circumstantial evidence for my allowed limits; which I am sure the world will agree will be filled up much more consistently with the avowed spirit of this work, by treating of that which admits of an abundance of proof – their actual existence, their customs – and misfortunes; and the suggestions of modes for the amelioration of their condition." In addition to this statement Catlin seemed to think that the Native Americans came from more than one source. One of these sources of influence may have been the Jewish people. How or when, he did not know. "I believe, with many others, that the North American Indians are a mixed people – that they have Jewish blood in their veins, though I would not assert, as some have undertaken to prove, 'that they are Jews,' or that they are 'the ten lost tribes of Israel.' From many of their customs, which seem to me to be peculiarly Jewish... I am forced to believe that some part of those ancient tribes, who have been dispersed by Christians in so many ways, and in so many different eras, have found their way to this country where they have entered amongst the native stock, and have lived and intermarried with the Indians, until their identity has been swallowed up and lost in the greater numbers of their new acquaintance, save the bold and decided character which they have bequeathed to the Indian races; and such of their customs as the Indians were pleased to adopt, and which they have preserved to the present day." "I am induced to believe thus from the very many customs which I have witnessed amongst them, that appear to be decidedly Jewish; and many of them so peculiarly so, that it would seem almost impossible, or at all events, exceedingly improbable, that two people in a state of nature should have hit upon them, and practiced them exactly alike." 1. Worship of one God. "The first and most striking fact amongst the North American Indians that refers us to the Jews, is that of their worshiping in all parts, the Great Spirit, or Jehovah, as the Hebrews were ordered to do by Divine precept, instead of a plurality of gods, as ancient pagans and heathens did – and their idols of their own formation. The North American Indians are nowhere idolaters – they appeal at once to the Great Spirit, and know of no mediator, either personal or symbolical." "The Indian tribes are everywhere divided into bands, with chiefs, symbols, badges, etc. and many of their modes of worship I have found exceedingly like those of the Mosaic institution. The Jews had their sanctum sanctorums, and so may it be said the Indians have, in their council or medicine-houses, which are always held as sacred places. As the Jews had, they have their high-priests and their prophets. Amongst the Indians as amongst the ancient Hebrews, the women are not allowed to worship with the men – and in all cases also, they eat separately." 3. Belief in divine favoritism. 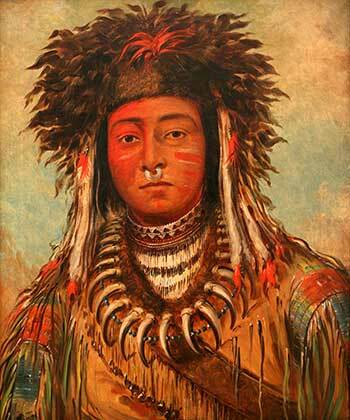 "The Indians everywhere, like the Jews, believe that they are the favourite people of the Great Spirit, and they are certainly, like those ancient people, persecuted, as every man's hand seems raised against them – and they, like the Jews, destined to be dispersed over the world, and seemingly scourged by the Almighty, and despised of man." "In their marriages, the Indians, as did the ancient Jews, uniformly buy their wives by giving presents – and in many tribes, very closely resemble them in other forms and ceremonies of their marriages." "In their preparations for war, and in peace-making, they are strikingly similar." 6. Treatment of the dead. "In their treatment of the sick, burial of the dead and mourning, they are also similar." "In their bathing and ablutions, at all seasons of the year, as a part of their religious observances – having separate places for men and women to perform these immersions – they resemble again. And the custom amongst the women, of absenting themselves during the lunar influences, is exactly consonant to the Mosaic law. This custom of separation is an uniform one amongst the different tribes, as far as I have seen them in their primitive state, and be it Jewish, natural or conventional, it is an indispensable form with these wild people, who are setting to the civilized world, this and many other examples of decency and propriety, only to be laughed at by their wiser neighbors, who rather than award to the red man any merit for them, have taken exceeding pains to call them but the results of ignorance and superstition." "In their feasts, fastings, and sacrificing, they are exceedingly like those ancient people. Many of them have a feast closely resembling the annual feast of the Jewish passover; and amongst others, and occasion much like the Israelitish feast of the tabernacles, which lasted eight days, (when history tells us they carried bundles of willow boughs, and fasted several days and nights) making sacrifices of the first fruits and best of everything, closely resembling the sin-offering and peace-offering of the Hebrews." Despite many of these similarities with the Jewish people, Catlin believed that the Native Americans did not come from a singular source but was influenced by many people. He believed this due to the immense diversity in languages and customs. Catlin was also known to disagree with other writers and scholars on this subject. "Many writers are of opinion that the natives of America are all from one stock, and their languages from one root – that that stock is exotic, and that that language was introduced with it. And the reason assigned for this theory is that amongst the various tribes, there is a reigning similarity in looks – and in their languages a striking resemblance to each other." "I should reason just in the other; and pronounce this, though evidence to a certain degree, to be very far from conclusive, inasmuch as it is far easier and more natural for distinct tribes, or languages, grouped and used together, to assimilate than to dissimilate; as the pebbles on a sea-shore, that are washed about and jostled together, lose their angles, and incline at last to one rounded and uniform shape. So that if there had been, ab origine, a variety of different stocks in America with different complexions, with different characters, and customs, and of different statures, and speaking entirely different tongues; where they have been for a series of centuries living neighbors to each other, moving about and intermarrying; I think we might reasonably look for quite as great a similarity in their personal appearance and languages, as we now find; when, on the other hand, if we are to suppose that they were all from one foreign stock, with but one language, it is a difficult thing to conceive how or in what space of time, or for what purpose they could have formed so many tongues, and so widely different, as those that are now spoken on the continent." 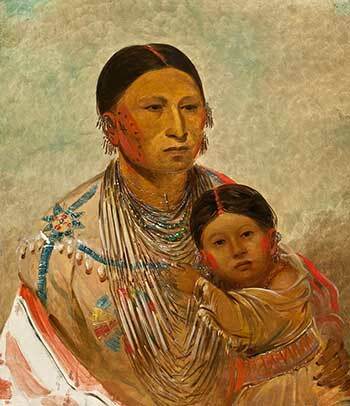 In conclusion, George Catlin saw many common trends in the appearance and customs of the Native American Indians; however, though similar, many differences did exist and, according to Catlin, it was more likely that several distinct peoples populated the American Continent, intermarrying, trading, sharing cultures, and so forth, culminating in the people we now know as the Native Americans.